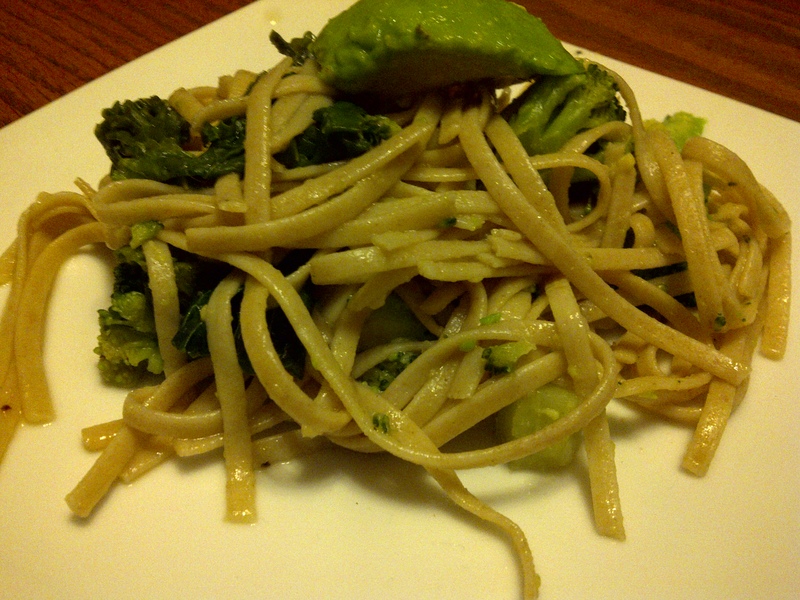 Pasta Della California – Health Freaxs Unite! Everything seems to go good with avocado in my opinion, though i seem to hate it by itself. But this dish is no exception to my love for it. In a garlicy pasta? Oh yeah. That’s a true Californian dish! The Pasta Della California (pg. 192) is probably one of my favorite dishes so far! You just make a garlicy spinach and wine sauce that is quick enough to make that it can be done by the time you finish boiling your pasta! There are so many different fresh textures and flavors, its like a party in your mouth! Broccoli was a nice touch and kind of added a bit of something to actually bite into. And this thing take 8 cloves of garlic! EIGHT!!! But wow is it quick and good! I guess anything with a ton of avocado and garlic can be called “Della California”, but this would probably take the cake as my favorite way to combine the two. What is your favorite quick, yet delicious week-night meal? I will put most of my posts on my Twitter or Facebook, so go follow me for updates! California-Pasta Eating Health Freax Unite!